The POV Dispatch is our internal newsletter. Of late I have been posting articles from our latest issue. Erin Bradner had a second piece in the latest issue where she interviewed two of her colleagues, Joanna Cook and Melissa Schmidt about how the AutoCAD team operates like a startup company. From where I sit in Autodesk, I'm seeing the AutoCAD User Experience team behave suspiciously like a lean startup. I think they're lean because for the first time in history, the AutoCAD team is not following a waterfall development process, they're using Agile practices. They're no longer waiting for betas to be built or for products to be launched before getting code in front of customers. Instead they're delivering code early and often to customer councils through mini-betas. Instead they're delivering code early and often to customer councils through mini-betas. They are pushing out those builds at the end of each sprint. On average, once every month customers on the councils receive a new and improved AutoCAD to test drive. Moreover, they're building a direct relationship with users that can best be described as a partnership. In the words of the User Experience (UX) Director for AutoCAD, the people who use AutoCAD are "more alive and in the middle" of the software design process than ever before. I talked to the Director of AutoCAD UX, Joanna Cook and the Senior Research Manager, Melissa Schmidt to hear how they are using Lean and Agile engineering methods to iterate faster, reduce waste, and deliver designs that bring distinct value to users. Here's what they said. ERIN: Lean Startups move quickly. How are you designing or coding faster? MELISSA: Our move to Agile enables us to design and iterate more quickly, and be more responsive to changing needs from both within and outside of Autodesk. Lean is a key tenet of Agile development. You do work in smaller chunks, and you have fewer bugs along the way. Allowing the team to focus on smaller goals helps them achieve working functionality faster. ERIN: Because measuring and learning are key to being Lean, how are you doing these two things faster? MELISSA: What is new and exciting for us right now is the launch of our AutoCAD Customer Councils, which are enabling us to move out of the usability lab and into the real world to get early feedback. We've brought together carefully-selected groups of customers who have similar needs to form councils for each of our big initiatives (e.g. Point Clouds, Connected Desktop, Geolocation). Instead of releasing a beta of AutoCAD at the end of the year, we release builds to the customer councils whenever they are ready. Now we don't have to wait for beta to post working versions to customers; they can try the functionality out in their own environments, with their own drawings, and with their own workflows. They can give us feedback quickly about what's working and what's not. A key to making this work is our use of Spoon, a virtualization technology, which makes the AutoCAD builds very easy for people to install and uninstall, and won't corrupt anything on their machine. And it can be run alongside their current version of AutoCAD. That's big. It lowers the barrier of entry for people to give us feedback, because they don't need a clean machine. ERIN: Tell me about continuous improvement. MELISSA: With continuous feedback from the councils, our scrum teams are able to quickly learn what's working and what's not for our customers, and what areas need more focus. 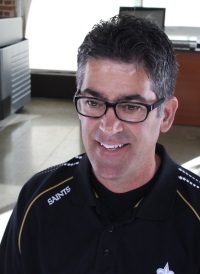 Rather than waiting for the beta cycle to have a stable build to give customers, the scrum teams are starting to align around a new, and better, goal: to quickly get a stable enough build for the customer councils that includes incremental changes that enable customers to try out real workflows and give real-world feedback earlier. With waterfall, you typically have a stabilization period at the end of the cycle when you focus on bug fixing, performance, etc. In Agile, one of the hardest things to adjust to is having a relatively bug free build at the end of each sprint. The customer council reviews make the goal of having a stable build that much more important. ERIN: Talk about the Lean UX goal of eliminating anything not adding value for the user. MELISSA: It's all about eliminating anything that doesn't add clear value or meet our user experience standards before you ship the product. If we don't do that, we end up with features that are not used or not finished but still add complexity to the software, and are very hard to take out later. The customer councils are giving us a tighter feedback loop with users, allowing us to make more informed decisions about what to cut or what to improve before we ship. ERIN: How do you measure outcomes in terms of value to users? MELISSA: We feel it's important to gather structured UX metric data through the councils. So in addition to encouraging council members to try out the AutoCAD builds with their own work, we post tasks for people to complete. These tasks map to our experience goals. By giving them specific tasks, we can have them report on task success, and have them rate their satisfaction as well as giving qualitative feedback. Through the quantifiable metrics of task success and satisfaction, along with the council comments, our scrum teams can know with confidence: We nailed this scenario [i.e. set of user stories], but not this other one. ERIN: What do users think about being on the councils? MELISSA: We've gotten great feedback from users on the councils. They feel like they are really partnering with Autodesk and know their feedback counts. For us, the councils are about building real human to human relationships. 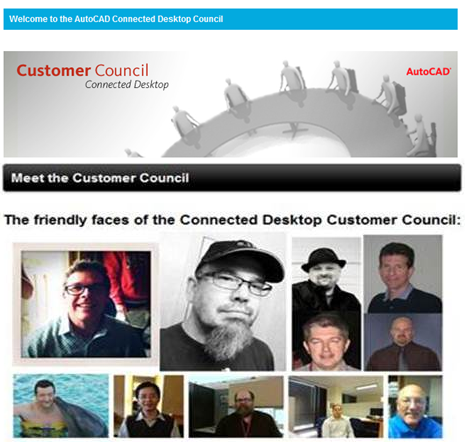 For example, customers as well as the Autodesk team members post their pictures and bios on the Customer Council portal. The tone we use throughout is very much as a partnership. One of the Connected Desktop council members wrote: "I thought I would send a message of thanks for all the effort your team has put into this study... I really like the direction Autodesk is headed with collaboration." ERIN: Talk about eliminating waste in the UX design process. MELISSA: AutoCAD UX is in a place where are trying out new methods to evolve our design process -- I don't think we've got it all nailed yet. But moving to Agile and leveraging Customer Councils is enabling us to get earlier feedback about what is more important to users, which allows us to spend more time on what matters to our customers. ERIN: I think the AutoCAD team is working like a Lean Startup, what do you think? JOANNA: I hadn't thought of it that way but I can say that each of our initiative teams [feature team replacements] is like a startup. The Shoreline effort got real working software into the hands of user quickly so we could collect feedback quickly. With Modernization we are optimizing the product for an incredible experience on new and modern hardware. To justify that, we need to get feedback from users on performance with their real drawings, on their real system, doing real tasks. Rather than the feature teams of the past, initiative teams let us define and align against a multi-year product strategy. For example, the Modernization initiative is much more than just replacing a graphics system. It involves creating a complete and modern interactive experience build on top of it. It can't be done in a year. We'll work on it until it is done. It may take several more years to do that. Erin, why do you think we're like a startup? ERIN: Like a startup, you're iterating quickly and adding incremental value to users with each build, but you're also innovating. Talk to me about how you're innovating. JOANNA: An analogy might be high definition TV and standard TV. Did you ever think TV was going to get that much better? Once we get the new graphics system [OGS] integrated with AutoCAD, and design the experience on top of it, the results of that overhaul will be that users will have a much more visually satisfying experience. Line work will even be more beautiful. Line work will be art, instead of just lines. 3D will scream. With the modernization effort, users will design as fast as their brains can think. Yes, users always want the graphics and performance to get better, but they couldn't even imagine what a total experience built on this system can be until we deliver it. ERIN: What, if anything, is lean about this new way of working? JOANNA: Our design teams are small, relative to engineering teams. How do you get 90% production from a UX team? Not with Waterfall. With Waterfall, much of the designs that we spec'ed never got built. You overthink the whole solution; then once it gets scoped you're rushing to plug holes. With Agile, not only are we getting code out there more quickly, we're also better able to capitalize on our design talent. Designers are spending their time on designing functionality that will be built not spending time designing things that end up on the cutting room floor. ERIN: Melissa spoke to me about how your team is measuring value to users. Tell me more. JOANNA: Building on the example of modernization, it's also doing work where it matters most to them. They get paid for their design production and time is money. To our users efficiency is critical. AutoCAD being what it was we haven't been able to do true WYSIWYG - you often couldn't see something before it is done. [When the modernization initiative is done] and you're running a command, like trim or fillet, you will see a real-time preview of those actions. Maybe we can get to the point where UNDO isn't one of the most used commands in AutoCAD [laugh]. ERIN: What's next? Where is this new Lean and Agile design process heading? JOANNA: We need to ensure we understand our customers in a meaningful way. We design software experiences for people who design the world. That is an honor and a great challenge. Without deeply connecting to them, how can we innovate in meaningful enough ways to achieve this? The risk with Agile is that you can forget to balance day to day with the entire experience. What should the ultimate experience be, why is it important to them, and how does it fit in with everything else? We risk going so fast that we miss the forest through the trees. Also many of the best insights and innovations take time and reflection. They require thoughtful analysis and synthesis of information. Taking the time to develop a sense of the big picture contributes to the lasting and important innovations and insights we need to have in order to create compelling experiences that stand the test of time. ERIN: Being Lean is about continuously improving. How are you improving your process? JOANNA: I'm trying to figure out how we can make it so that everyone on the team is immersed in the human side of things. So the understanding of the customer isn't only a flat clinical persona on paper. It's a complete, living, and evolving thing. When starting a project, UX designers need to think about the customer in all of the dimensions of their work. They need to know how the functionality in the initiative would look and feel in the users' world. I think of the Autodesk Gallery [at One Market]. Anytime I lose focus with my work, I go to the gallery. I want to create a gallery experience for everyone on the design and engineering team. I want to help our staff really live with the users and keep them in the middle of their work. I want us to be able to represent the true north for the people who use AutoCAD every day. Thanks Erin, Joanna, and Melissa. A lean, mean, fighting machine is alive in the lab.